This Wood Plank Lobster Tails recipe only takes 20-30 minutes from start to finish. 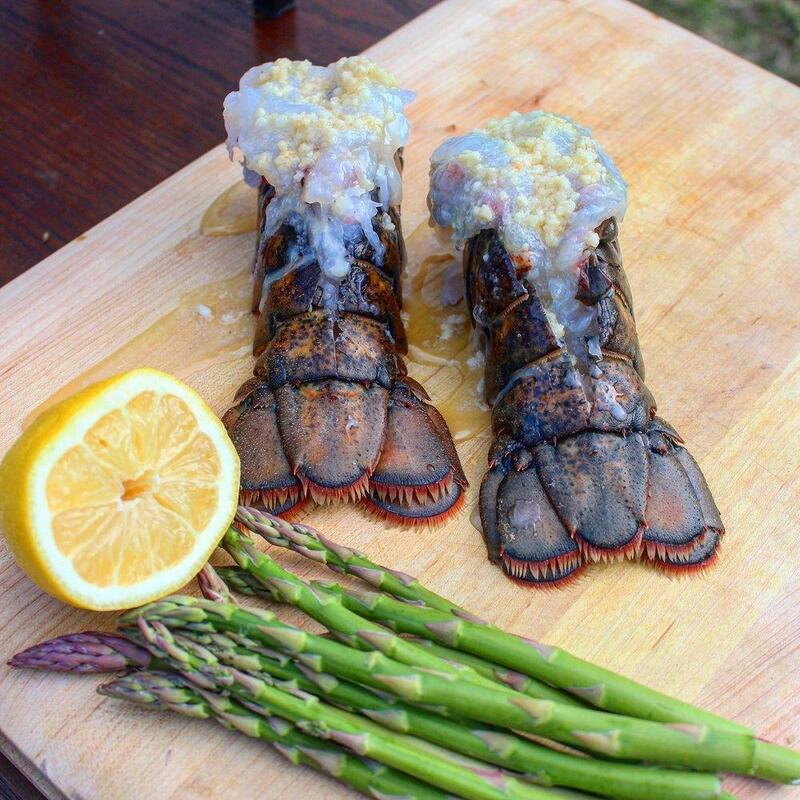 Super easy for a dinner, romantic evening or just wanting to grill some lobster, the Garlic Butter that is put on the tails is easy to make with simple ingredients. So get that grill ready because these lobster tails will rock your world. Learning how to cook on a wood plank for these Wood Plank Lobster Tails is key to their success. Wood planks are amazing for adding smoky and savory flavor to any meat. They allow the food to receive a form of indirect grilling without sacrificing any of the flavor. I chose to use a Western Wood Plank because I trust their quality. Soaking the wood plank might seem useless; however, this really decrease the chance that you wood burns up over the fire. It will also add a smoky essence to the grill so that your food grills slower with a more natural smoke around it. Another factor to think about is the actual butterflying of the Wood Plank Lobster Tails. Butterflying lobster tail is not difficult, but can be intimidating. I highly recommend using a quality pair of scissors to cut through the top layer of the shell. If you use a knife, be aware of it going through the bottom layer of the shell. Cutting the bottom layer might make the shell unstable which will in turn make the butterfly technique for the Wood Plank Lobster Tails not possible. Also, be gentle when pulling the lobster out of the shell. Carefully make sure that you get every piece of the flesh out without ripping or tearing. The meat is hearty, but still subject to being ripped apart. Prepped and ready to cook! Ready to eat! Slow roasted Lobster Tails on some Western Wood Planks. Smoky, savory and full of great flavor! First, soak the Western Wood Plank in water for 1 hour. Second, you will need to butterfly the lobster tail (see video above). Once that is finished, melt the butter, onion powder, sea salt, and garlic cloves in a bowl and spread over the lobster meat. Finally, squeeze one half of the lemon on top for added flavor. Use some Cowboy Hardwood Lump Charcoal to light fire and let burn for 10-15 minutes. Once charcoal is white hot, push to one side of the grill for indirect grilling. Place a handful of Cowboy Cherry Wood Chips on the fire for added flavor! 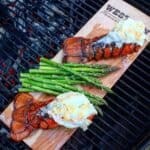 Place the lobster tails and veggies on the soaked wood plank and place on the grill for 10-12 minutes. Cook until the lobster meat is completely white. Take the lobsters off the grill, serve & enjoy! Equipment Needed: Enclosed grill, Cowboy Charcoal, Western Wood Planks, Cowboy Cherry Wood Chips, tongs, shears, and a cutting board.